Swedish rapper Yung Lean, has recently completed his biggest UK headline show to date – titled “Wings of Desire” – at London’s 5000 capacity O2 Academy in Brixton, while accompanied by an Allen & Heath dLive Wings set-up. The full audio set-up – owned by FOH engineer Gustav Brunn – is used for both FOH and Mon duties and features a dLive C1500 surface fitted with a Waves 3 card at FOH position in conjunction with a CDM32 MixRack, fitted with a Dante card, and an IP6 Controller at stage position. On stage, a DJ performs alongside the artists using Ableton Live with the outputs sent to the CDM32 via Dante. The IP6 is used to allow the production / stage manager to make quick adjustments to the monitor mix, DJ mix and musicians IEM’s. Yung Lean became widely known when the music video for his track “Ginseng Strip 2002” went viral, exceeding 2 million views on YouTube. The recent event follows his new single ‘Poison Ivy’ and featured a night of music, art and various other Swedish artists such as Bladee, ECCO2K and Thaiboy digital. 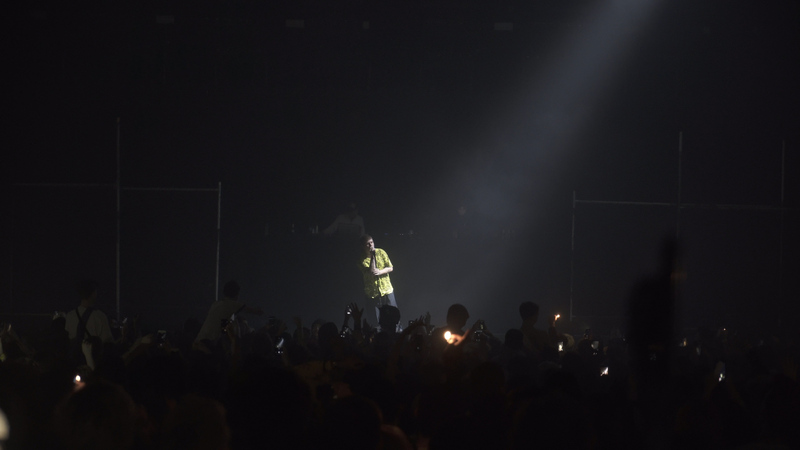 The post DLIVE LANDS AT O2 BRIXTON ACADEMY WITH YUNG LEAN appeared first on Allen & Heath.